The San Francisco 49ers are going to the Superbowl! On Sunday, February 3, 2013, the San Francisco 49ers faced off against the Baltimore Ravens in Superbowl XLVII. Taking place in New Orleans, this marked the Niners’ first appearance in the big game since 1995. Although it was designed to be a baseball stadium for the San Francisco Giants, the 49ers have called Candlestick Park home since 1971. Located in Bayview Heights and alongside the San Francisco Bay, up to 70,000 screaming fans flock to “the Stick” for every home game. All photographs on this page were taken on November 13, 2011, during a late-season game versus the New York Giants that I attended with my friends Randy and Damon. It was an incredible afternoon at Candlestick, as the Niners came back with 15 points in the 4th quarter to win the game 27-20. Candlestick Park is a traditional stadium for the era it was built. This means lots of concrete, no focus on views beyond the field, and the dimensions of a giant oval. For a photographer, this setup offers a bonanza of subjects to point my camera at. Even Yoda is a San Francisco 49ers Fan! [UPDATE] Sadly, the Baltimore Ravens wound up winning that Superbowl by the incredibly close score of 34-31. 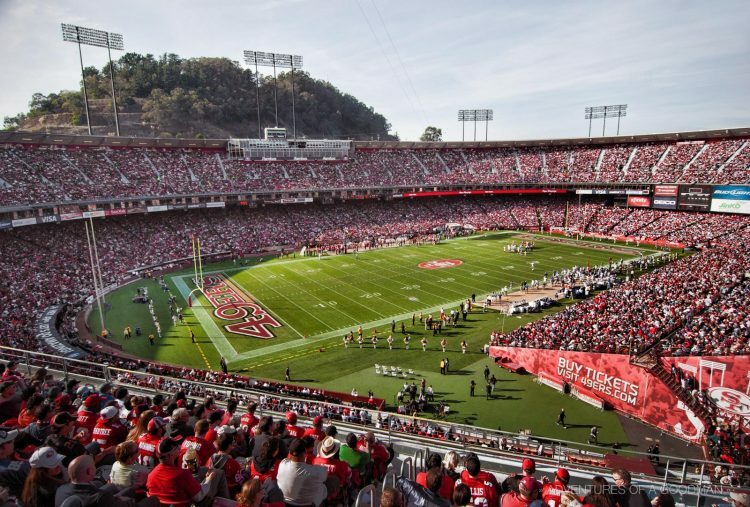 [UPDATE] The San Francisco 49ers moved to a new stadium after the 2013 season. Candlestick has since been demolished, and only lives on in memories and photographs.